The Appture universal app for iPhone, iPod Touch, and iPad allows you to create publicly or privately shared photo albums enhanced with audio. With the Appture app you can include photos stored on your iOS library, as well as your Facebook, Instagram, Flickr, and Picasa accounts with proper authorization. You and anyone who views your photo album have the option of including an audio message for personalization. 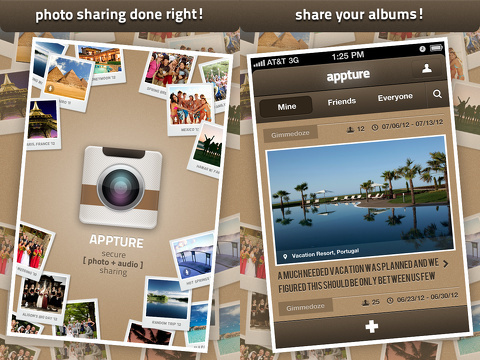 But, it is necessary to overlook Appture’s sad appearance to make it your go-to photo sharing iPhone app. The Appture iPhone app requires a Facebook or email log-in to get started. You quickly create a photo album with a simple list format. You type a title for the album and select a cover photo. Each cover photo can be enhanced with the excellent tools of the Photo Editor by Aviary iPhone app. The options and tools have the same interface, so you can currently select from 14 different functions to add text, crop, eliminate redeye, enhance with effects, and more. You can add the dates, location, and members. Members include contacts from your address book and Facebook. You can also create groups, so a family can establish one group to streamline the process of creating a photo album. With one touch, you can allow participants to add photos and establish level of privacy. The default is private mode, and the choice to make the album public results in your album posted in the Appture iOS app community feed. You can add multiple images to complete your album, but you cannot edit them with the Photo Editor by Aviary interface. You can, however, touch a microphone to create an audio message to enhance the photo. An arrow remains on the screen for you to press to hear the audio. The audio feature is a nice, unexpected touch. The navigation for the Appture iPhone app is fairy straightforward. Your home screen has three different feeds– mine, friends’, and everyone, so you can scroll, like, comment, and add audio. The feeds are reminiscent of Pinterest with the impact of the cover photo and a synopsis of feedback. Unfortunately, the graphics, style, and vibe of the Appture iPhone app diminish the user experience. The graphics look like dirt and mud muddled together. 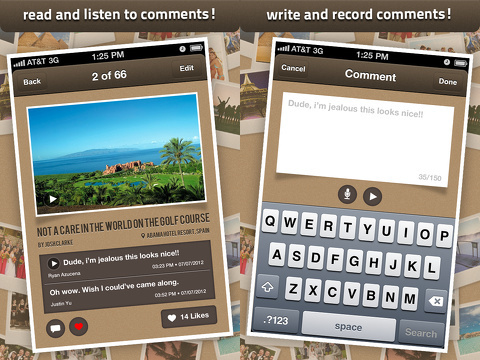 There is no real finesse or intrigue to draw users to the Appture iPhone app social community. Your sample photo album can wind up in the Appture iPhone app everyone feed, so a tutorial or other interface may create better engagement. The Pinweel photo sharing iPhone app incorporates similar functionality to Appture, but imbues the interface with vibrant, witty, exciting, and effective tools to engage and create repeat users. The Appture iPhone app’s audio enhancement feature is cool, but the dull graphic presence and unappealing vibe make it a real drag. AppSafari review of Appture : Secure Photos + Audio was written by Jenni Ward on August 8th, 2012 and categorized under App Store, Free, iPad apps, Photos, Universal, Video. Page viewed 5692 times, 1 so far today. Need help on using these apps? Please read the Help Page. Thanks for the review and feedback! We really appreciate it. We’re working to create a much smoother and engaging user experience for the next version. Reviewer complains that “the graphics look like dirt and mud muddled together.” Uses same color scheme on their website.